Note, they won't respawn if the player is nearby, or if there are base modules too close. 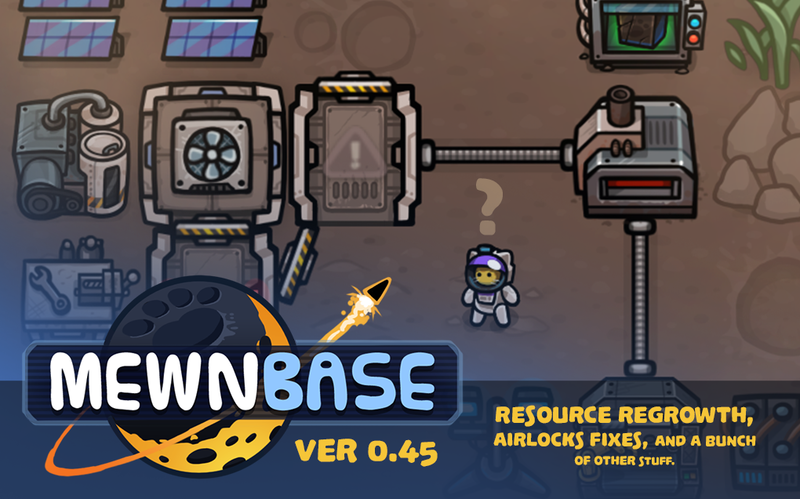 Airlocks must now be properly attached to habitat modules in order to get air in them. Airlocks not properly attached have a warning symbol on them, and their door status lights are off instead of red/blue. Habitat modules no longer start filled with oxygen every time they're placed. HUD notifications won't block clicks behind them. Inventory clicks are no longer blocked when a buggie behind them. Player must now be next to the buggie in order to open its truck storage. Generator won't let you keep dumping resources into it when its full. Better tooltips for consumable items in your inventory bar, shows you how much hunger food will restore. HUD tech tree button now shows how many samples you have to spend. Thanks to the players over on the MewnBase Discord channel for helping report bugs and issues! Me and my friend love to play this game and love the work you have put into this game.